The grapes are sourced from a mix of organic and sustainably farmed vineyards in Nova Scotia’s Gaspereau Valley. Minimal sprays are used while vineyard work and picking is all done by hand. A bright standalone refreshment on a warm summer day, Nova 7 shows tremendous pairing versatility, ranging from being a crowd pleasing aperitif to the perfect match for spicy and aromatic fusion and international fares. At a lower 7% alcohol, Nova 7 is remarkably refreshing on a hot summer afternoon, wonderfully festive during the holiday season and perfectly suited for any celebration. Conceived by Canadian winemaking icon Peter J. Gamble, Nova 7 is a proprietary blend of signature aromatic whites, highlighting select Muscat grape varieties. This lightly sparkling, off-dry wine is uniquely Nova Scotian, combining the region’s lively acidity with elegant aromatics. Made from 100% Nova Scotia grapes, part of the wine’s broad appeal comes from its artisan nature – very minimal intervention in the cellar means each vintage reveals something special and unique from the other. A proverbial Nova in its ability to marry freshness and aromtaics, this 2013 displays the subtle pink colour that has de ned recent vintages, while taking the oral instensity to new heights. An ambitious and visionary project, in 1999, Gerry McConnell and, his late wife, Dara Gordon purchased land in the Gaspereau Valley with the bold vision to create a world-class winery that would reflect an unconditional commitment to producing spectacular wines. 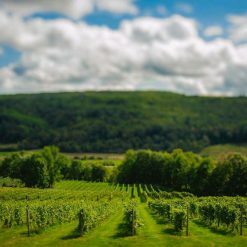 At that time, the Nova Scotia wine industry had only a few wineries with widely varied wine portfolios, so they sought expertise from outside the region to assess the potential for terroir-driven wines in Nova Scotia. In 2000, leading winery consultant and international winemaker, Peter J. Gamble, was engaged as wine consultant with his partner, winemaker Ann Sperling; that year, land was cleared, tiled and subsoil was fractured in preparation for the first plantings. 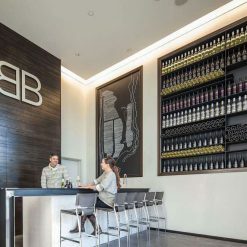 After significant research, they recommended Benjamin Bridge develop a specialized wine portfolio by exploring the potential to produce classic method sparkling wines and brisk, aromatic whites. Upon the recommendation of Peter Gamble and Tom Stevenson, the world’s foremost Champagne authority, Gerry and Dara contacted leading Champagne oenologist Raphaël Brisbois, former chef de cave for the legendary Piper Heidsieck. Raphaël agreed to tour and assess the vineyards and the region, and after tasting tremendous potential agreed to consult, until his recent passing in late summer 2013. In 2002, the rst experimental sparkling wines were made; seven different cuvées in all, in order to better understand the terroir, the varieties, the structure and the aromatics. Subsequent cuvées followed in succession with the exception of 2006, when a devastating winter (minus 26.5 degrees Celsius) struck the Gaspereau Valley. In view of the minimal size of the traditional vinifera harvest, the company elected not to make a classic method sparkling wine in 2006. To date, approximately 40 acres have been planted to grape vines. Gerry and Dara wholeheartedly supported the organic approach advised by the Gamble/Sperling team, and from the outset, the vineyard advanced quickly to full organic certification. More than half of the plantings is devoted to vinifera grapes (primarily Pinot Noir, Chardonnay and Pinot Meunier, but also some Sauvignon Blanc for still winemaking). After the purchase of an additional 60+ acres of farmland adjacent to the current estate in 2013, the estate will grow to 75 acres of vineyard by 2018. 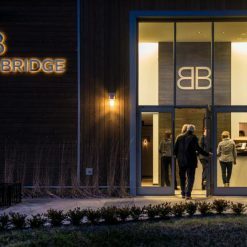 Since 2009 Benjamin Bridge has also worked with a select number of local grape growers who share its passion for and dedication to quality in the vineyard. In 2007, an ‘early-disgorged’ Benjamin Bridge classic method sparkling was selected for a debut at the legendary James Beard Foundation in New York City with Nova Scotia chef, Michael Howell. In 2008, Benjamin Bridge head winemaker, Jean-Benoit Deslauriers, joined the winery and, from there, began crafting its sparkling and still wine vintages, in consultation with Peter and Raphaël. 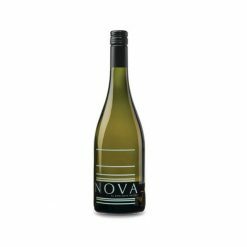 These wines include Nova 7, an off-dry, slightly effervescent white wine that has become the top selling white wine in Nova Scotia, outpacing all domestic and international offerings. 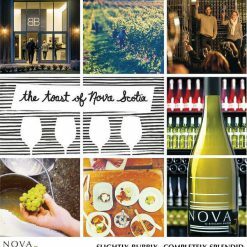 Nova 7 has been coined Nova Scotia’s “iconic wine”, becoming the first Nova Scotia wine to be listed in Ontario and available across Canada. In 2009, an ‘early, hand-disgorged’ Benjamin Bridge classic method sparkling was selected by leading international Champagne expert Tom Stevenson for presentation at the inaugural International Sparkling Wine Symposium in London, England. Tom was the keynote speaker and, as this was the only wine selected, it was a singular honour for Benjamin Bridge. In November 2010, ten years after clearing the land for planting, Benjamin Bridge released its much anticipated, debut classic method sparkling wines in Nova Scotia – a 2004 Méthode Classique Brut Reserve (57% Pinot Noir, 22% Chardonnay, 15% Vidal and 6% L’Acadie) and a 2004 Méthode Classique Blanc de Noirs (100% Pinot Noir). In 2010, the Benjamin Bridge winemaking team also transitions to a sparkling wine program that is 100% vinifera-based. In August 2012, Benjamin Bridge’s Méthode Classique Rosé was one of only two Canadian sparkling wines poured at Canada’s High Commission in London to showcase Canada’s best wines during the Summer Olympics. Sparkling wine production volumes, in the range of 1,200 bottles per annum during the company’s initial years, have grown slowly as the company’s vineyard plantings continue to expand; 10,000 bottles from the 2012 harvest were cellared for future release. In recent years, Oz Clarke, one of Britain’s most famous wine writers, declared: “Benjamin Bridge is the new Canadian sparkler star.” And John Szabo, Canada’s first and only Master Sommelier, declared, “I’m confident in stating that this ‘05 Brut Reserve is very likely the nest sparkling wine to have yet been issued from Canadian soil”.